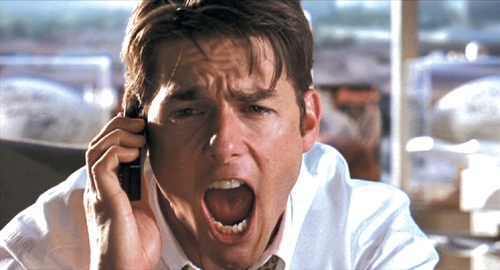 Business Movie Review: Jerry Maguire - Brilliant Breakthroughs, Inc.
Sports Agent Jerry Maguire shouting to client, "Show me the Money!" here it is almost mind-boggling. Yet true to form, we will keep this oversimplified! This classic movie is simple: dissatisfied, yet successful, Sports Agent, Jerry Maguire, is on the verge of awakening to the concept of conducting authentic business filled with integrity while having a meaningful life – you remember, the idealistic vision we had when we started our career! Not going to spoil anything here… What I want to do is focus on his mentor, Dicky Fox, who dispenses his uplifting wisdom throughout the movie. Note: Typically we discuss 3 Business Strategies from a movie, but I didn’t want to break up the golden nuggets Dicky offers us. The key to this business is personal relationship. It takes Jerry a long time to get this and then truly step into it as he remembers this is who he really is. The movie is consistently filled with Breakdowns and Breakthroughs. Enjoy the ride! Always Remember: this Business Strategy is what makes you a star in the eyes, minds, and hearts of your clients. Roll with the punches, tomorrow is another day. Jerry is all over the place. Does this look or feel familiar to you? Jerry states an important Customer Service phrase for all of us to apply, when he realized he had spent far too much time talking and not listening. Finally, he says, “Help me, help you”. Ask you customers how you can help them. Then be quiet and wait for the answer. You will learn so much and Own your Marketplace if you respond to their needs. OK, these two go hand in hand regarding relationships. When was the last time you thought of engaging your heart into your business day? Your head can mastermind all day long, but it’s how you engage your heart to emit your passion – that’s what people are really attracted to 🙂 When you allow your passion to emerge, typically by engaging your heart, people see how human you are and can begin to relate to you. Try it more and more, each day. Now these quotes come from Dicky when Jerry is struggling to be a decent professional, and even a decent guy. Thus, they are both about relationship. I share a similar message, “Business is nothing but relationship. The only difference is the topic is focused around a product or service… it’s nothing more than relationships.” Jerry is measuring his relationship performance throughout the moving. What Dicky is really telling Jerry is you can’t sell anything unless you care to care about your customer’s needs or potential customers needs and how your business solution will improve their world… it’s not about what you gain -that’s a by-product of doing good business! Gee, is there really a need for comment here? Set your intention and see how the rest of the world conspires to deliver to you what you proclaimed you want. If you haven’t done this before, just try it – it’s amazingly simple and the results are miraculous! Isn’t this an awesome quote? Humble, vulnerable, and caring. It doesn’t get any more vulnerable or real than this! This one drives home many points of vulnerability. People love to be able to relate to others and tend to favor those who speak authentically.Failure, again vulnerability, surfaces and Dicky shares that persistence is the key – believe! Last, this was what the entire movie is about: work-life balance and being an outstanding professional of integrity. What’s the sense in doing all the crazy things we do for “work” if we don’t take the time to find someone to enjoy all the fruits of your labor with for the rest of your life? Just recently a person told me how fortunate I was because I am doing what I love doing and it financially supports me and gives me the flexibility to live they way I prefer. I had to stop and soak that in. Some how, while I was striving to achieve this, I hadn’t realized that I accomplished it! I am grateful for this awareness and appreciate all the people I work with. I enjoy having laughter and zaniness built into our working relationships and am honored to help them build awesome businesses so they have the opportunity to experience the blessing of being fortunate too! Thanks Jerry and Dicky for sharing your raw experiences which so many of us can relate to and learn! Next Review: It’s a surprise! ← Business Strategy: Perception in YOUR Marketplace Matters!